Do you need a better way to locate the research helps you’ve accumulated through the years? Are you drowning in paper? 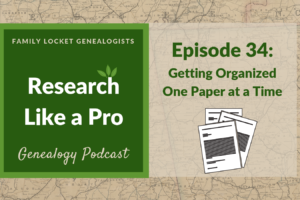 Do you have stacks of handouts from genealogy conferences and classes? What are you doing with that blog post or online article you know you’ll need in the future? Solve your organizational problems by creating your own genealogy reference center using the popular tool Evernote. I started using Evernote three years ago, transferring research articles, maps, charts, templates, and various other helps. I now have an impressive electronic reference center with the articles that I need to assist my research, all organized into notebooks with tags and titles. Evernote can seem daunting, so I’ll share the method that I use. The first step is to sign up for a free account and download Evernote to your desktop. You’ll need to create a log in with an email and password. Start with a free account and try out the various features. If Evernote works for you, you can always upgrade to a Premium account to access more features. I used the free version for at least a year before upgrading. The beauty of Evernote is the ability to access your notebooks and notes on the internet from any computer. For the free version (Basic), you can sync your collections across 2 devices and you will have offline access on your desktop. The Premium version allows you to sync across multiple devices. I have the Evernote app on my smartphone and can access any note there. Once you’ve downloaded Evernote to your desktop, it’s time to add notes and notebooks. Think of Evernote as a blank slate. You are in charge of creating your system, so putting some careful thought into it at the beginning will yield dividends later. Evernote uses a nesting system – notes nested within notebooks. Notebooks can also be stacked in groups. Think of this physically. I have a stack of notebooks titled “United States Research.” Within that stack are the following notebooks: “Gulf South States Research” “Mid South States Research” and “United States General Research.” Each of those notebooks is filled with notes on various topics pertaining to the specific notebook. The screenshot below shows the hierarchy. Starting from the left: Notebooks (dark blue section) > Notes within a notebook (middle section) > Highlighted note (far right). This example illustrates notes within my notebook titled “Gulf South States Research Helps.” My accreditation region is the Gulf South, so this notebook contains any type of article or handout concerned with researching Florida, Georgia, Alabama, Arkansas, Mississippi, Louisiana, or Texas. 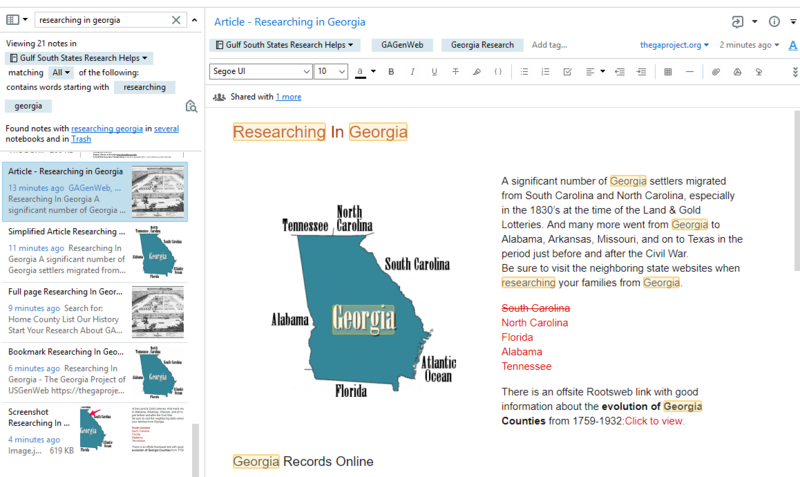 The title of the notebook is shown in the middle section “Gulf South Research Helps.” The notes can be sorted a variety of ways. In this example they are sorted alphabetically, so those with “Gulf South” in the title are grouped together. Each note has a thumbnail view with a title and image, the date created, and a short description generated by Evernote from words in the note. Showing are thumbnails of notes I’ve created to help me research in the Gulf South region. Included are a list of reference books, a research guide for the region, a handout from a webinar, and slides from a PowerPoint presentation. This notebook contains 82 notes, so only about 8 are shown on the screen at a time. You can scroll through the notes or use the search capability in Evernote to find specific notes. Clicking on any of the note thumbnails in the middle section selects it and the full note shows to the right. In the example, the selected note is highlighted in blue in the middle section. This note titled “Georgia State Research Outline and Guide” appears on the right. This is one of several locality research guides I have created in Evernote. They are word searchable and allow live links to websites. I can view the notes from this screen or open the note in another window. I can have multiple notes open at once, each in its own window. You might want to share a notebook with a fellow researcher, a client, or family member. Notebooks as well as individual notes can be shared. In this screenshot of my notebooks, notice the color differences. White notebooks were created by me and not shared. Red notebooks are created by someone else and shared with me. Blue notebooks are created by me and shared with others. The sharing feature makes Evernote interactive and useful for a variety of purposes. Nicole and I share several notebooks. When you share a notebook with another individual you can give them permission to edit or just view. The notebook permissions can be modified at any time. I like to organize my notebooks into stacks. The “Genealogy Education” notebook is closed so the several notebooks stacked under it such as “DNA” and “All About Genealogy” are not showing. I can open the notebook stack to show all the notebooks within or close it for a cleaner look. In the screenshot only the “United States Research” stack is opened. The white notebook icon to the left of the three notebooks shows that they are in a stack. The notebooks are blue because they are shared with Nicole. To the right of each notebook is the number of notes it contains. Before you start creating notebooks, look through your papers. Think about the categories that would be helpful to you. Do you need a notebook for preservation? DNA? Research helps? Ireland? Once you’ve decided on the notebooks you’d like to use, create notebooks by clicking FILE, then NEW NOTEBOOK. It’s as simple as that. You’ll enter a name and then you’re ready to add notes to the notebook. To stack the notebooks, just drag a notebook to the parent notebook. To unstack, drag it back out or right click and select “unstack.” I reorganize my notebooks from time to time as the need arises. Evernote makes it very easy. Several books, blog posts, and YouTube videos are available to help you master Evernote. Notes can be added in a variety of ways: web clipping, typing, or uploading a PDF or image. Evernote has a free basic version that allows 60 MB of uploads a month. I upgraded to Premium so that I can upload up to 10 GB a month and search my PDF’s. See Which Evernote product is right for me? for more information. Article – Evernote copies the article with the links intact, a link to the website, photos, and text. Simplified Article – Evernote takes just the main points of the article, eliminates the photos and much of the text. Full Page – Evernote copies the article as well as the general website information at bottom of the page. Bookmark – Evernote creates a snippet of the article, choosing a main image and clearly providing the link. Screenshot – Evernote lets you take a screenshot then annotate the image. You can add arrows, highlight text, and more. You can click on each option and you’ll see a green box around what will be clipped. For example, I located a great article on the internet titled “Researching in Georgia” . I wanted to save it to my “Gulf South States Research Helps” notebook for future reference. I clicked the elephant icon and the black box appeared with my clipping options. I selected “Article and the green box surrounding just the main article showed what would be clipped. Website information from the top and the bottom was eliminated. When you’re getting started with web clipping, experiment with the various options to see what will be clipped to Evernote. Click on each option to see how the note will appear in Evernote. Depending on the website, you might want to just take a screenshot. Taking a screenshot brings up a different menu allowing you to annotate the image. 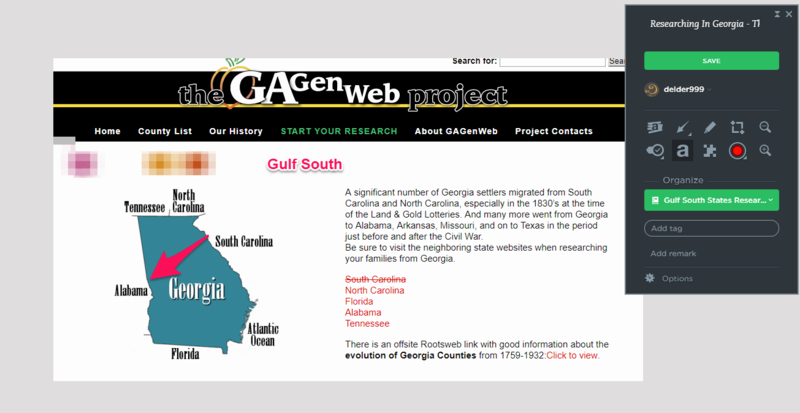 In the screenshot below, I’ve added the red arrow pointing to Alabama, blurred the title “Researching in Georgia” and added the words “Gulf South.” To annotate, simply double click on any of the tool icons, then draw, highlight, blur, add text, etc. Double click again on the image to end the action. The best way to learn how to annotate is to experiment with each tool. To illustrate, I created a note in my Gulf South notebook using each method of web clipping and put the method in the title. The screenshot below shows the various ways Evernote created a note from the same website using the Web Clipper. 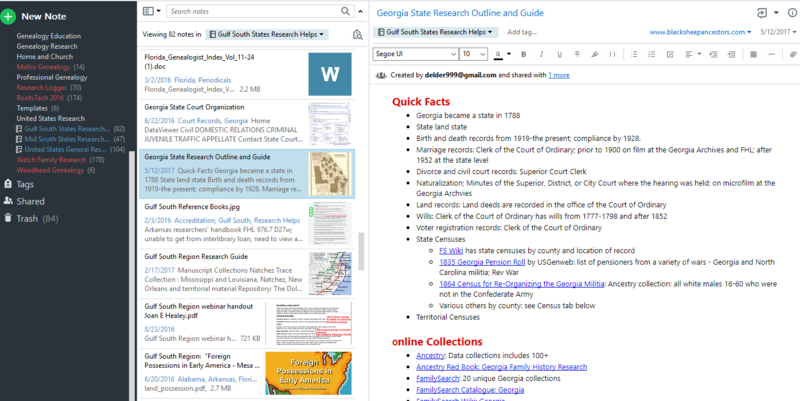 On the left is the thumbnail, on the right is the highlighted note; “Article – Researching in Georgia.” Each includes a link to the article (in blue, top right), but each is captured a little differently, even using different images from the article. I generally clip the the web page as an “Article” so I don’t need to go to the original site each time to view the information. As you experiment with the tools, you’ll settle on the method that you like the best. I recommend trying out each view, just as I did here. Add the type of clip to the title so you can clearly see what you like best. Notice in the screen shot below that I typed “researching in georgia” in the search bar. This located all notes with those words for me. The search terms are highlighted in each article. I attend a lot of genealogy conferences and watch a lot of webinars. Each presenter has usually created a useful syllabus packed full of information I want to reference in the future. Most of these handouts are now distributed electronically in PDF format. I can upload each handout to Evernote and give it as many tags as I want. 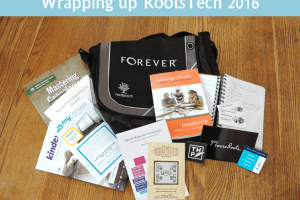 I generally tag a handout with the following: presenter (Diana Elder), topic (organization), webinar or conference (RootsTech 2018). I can search for all topics by a certain presenter, on a specific topic, or from a certain conference. I often include several tags for the topic category. Because I have a Premium subscription, I can annotate PDFs. This allows me to highlight the handout and add text during the presentation. I don’t need a separate document to take notes, I can take my notes directly on the presenters syllabus. If I did want to take separate notes, I would create a new note and type away. That note would also be tagged with the same information. If a handout or syllabus is not in electronic form, I scan it or use my phone to take a picture. Using the Evernote app lets me take a photo and add it directly to a notebook. Just like I can share any photo to Facebook, Instagram, etc. I can share a photo to Evernote, put it in the correct notebook, add a title, and tags. All from my smart phone. The real beauty of Evernote is the searching capability. Imagine being able to search for all references to church records in your large collection of notes. In the example below I’ve entered “church” as my search term. Evernote found 34 notes in my United States General Research notebook. The OCR capability also searches PDFs and images that I’ve uploaded. I can narrow my search or search by tags to find specific information. The highlighted note is a PDF of a research guide created by the Utah Valley Regional Family History Center, located at the BYU Harold B. Lee Library. 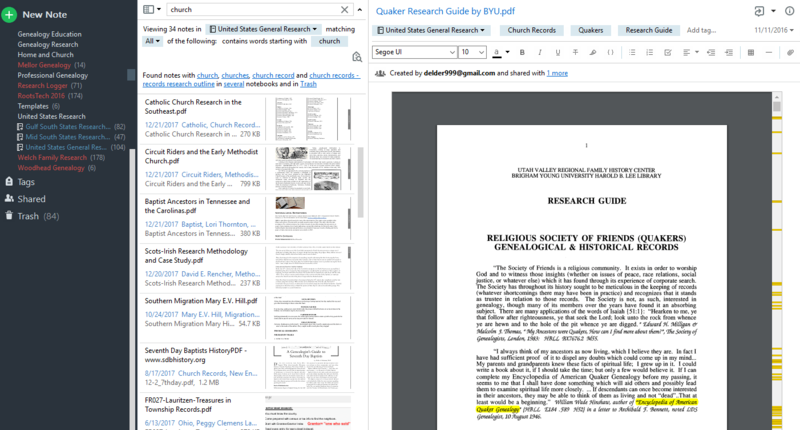 The guide deals with Quakers records and Evernote found several mentions of “church” in the document, noted by the yellow bars on the far right side. Scrolling through the document, each mention of church is highlighted so I can quickly find the mention. Once Evernote has found the notes with my search term, I can then use the CTRL+F feature to quickly search individual notes for a specific word. CTRL + F will not work on images, but the OCR capability will search images for words and highlight them on the page. Experiment with the search capabilities for both PDF and images to determine what will work best for you. With Evernote, I no longer have stacks of papers from past conferences or printed handouts from webinars lying around. I keep everything in one place and I can quickly find references to help my research move forward. If you’re interested in creating your own genealogy reference center with Evernote, give it a try. Download the free version, add some notes and see if this amazing tool can help you tame your paper jungle. 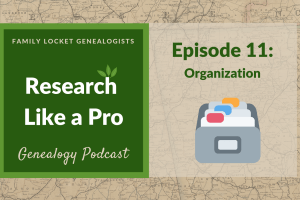 Stay tuned for the next article in this series: Using Evernote for Genealogy Research. 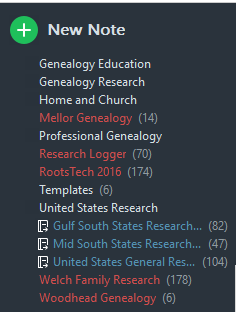 I have just started really using Evernote for my genealogy. I am soooooo mad I didn’t start sooner. I find it particularly ruseful for organizing DNA results. My computer desktop was littered with small text docuements about DNA analysis and matches. Now, they are all organized and I don’t need several programs open at once when working on DNA. It may seem difficult to use but once you start, I think most genealogists will be thrilled with it. Lasr week, I watched a terrific webinar and took notes directly in Evernote, took a couple of screenshots, and downloaded the sylabus. All of those items now reside in one file that I can easily access. This is a terrific article to get people started! Thanks, Andrea. I love your idea about using Evernote to organize DNA results and matches. Like anything, there is a bit of a learning curve, but it is well worth it. Nancy, You’re going to love using Evernote to keep your genealogy notes organized. Have fun – I bet you can’t stop at 30 minutes a day though.